The Golden Circle is usually second on everyone's list of top things to do in Iceland, after the Blue Lagoon. It covers about 300km looping from Reykjavik into the southern uplands and back. Three incredible locations make up the Golden Circle, each no more than a 2 hour drive from Reyjkavik, with multiple detours available to add to your trip if you wish. Tours are available, but I'd suggest completing the trip on your own so that you have the freedom to decide how long you want to stay in each place. Driving the Golden Circle can take as little as a few hours, or as in our case, it can take an entire day. Þhingvellir National Park is a UNESCO World Heritage site and has a historical significance for the people of Iceland as the location where the Althing, an assembly representing the whole of Iceland, was established in 930. One of the most notable things about this park is that it's situated directly between the North American and Eurasian tectonic plates. In fact, Iceland is the only country where the Mid Atlantic Ridge can be seen above sea level. 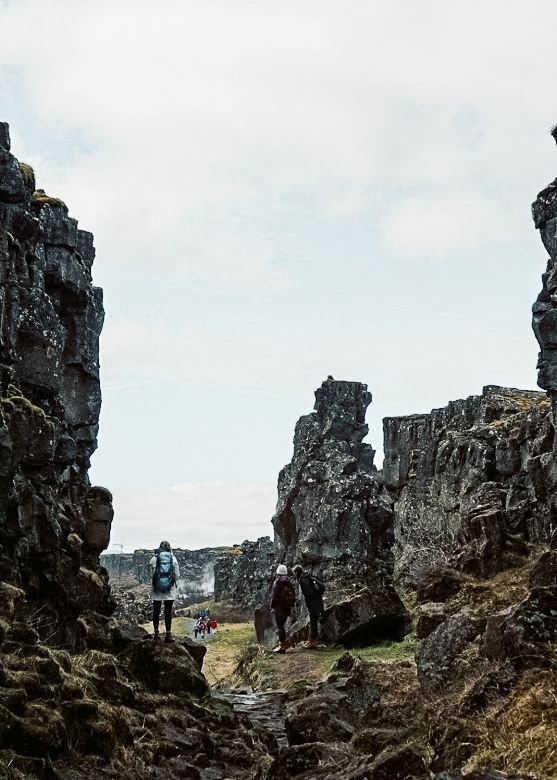 It's so visible, in fact, that you can walk in the Almannagja Gorge against the North American tectonic plate. My fellow GoT diehards will enjoy is learning that the Gorge was the shooting location for the Eyrie, and where Arya Stark and Sandor Clegane journeyed through the Riverlands. We spent our morning and early afternoon wandering around the park, taking in the waterfalls, and walking between the tectonic plates. It was the first of many time that day did we marveled at how a place like that could just naturally exist. The Silfra Fissure is actually located in Þhingvellir National Park, but it was such a unique experience that it deserves it's own spot. It is a crack between the American and Eurasian continental plates, and is also one of only places in the world where you can snorkel or scuba dive between them. The water in Silfra melts from the glacier Langjökull and travels underground toward the lake Þingvallavatn. The long filtration process is why the Silfra Fissure's water is devoid of sediment and is crystal clear. The water is so clean that you can actually drink straight from the lake. Trust me, we've done it! 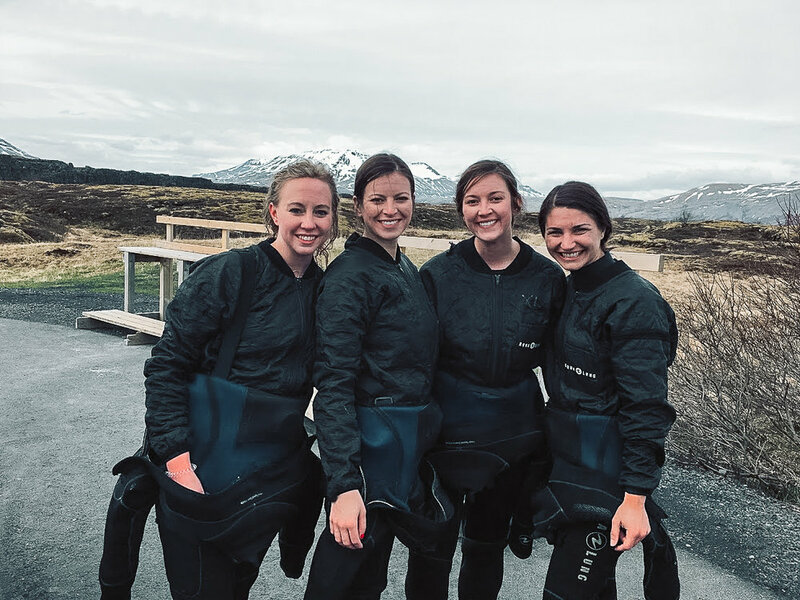 We booked our snorkel tour through Iceland Adventure Tours. Our tour guide was a man called Ivan, and he was an absolute gem. He helped us into our gear, cracking jokes as he told us about the details of the tour. Following those rules was a bit difficult for us in the beginning. Marykate panicked when we went into the water and immediately flipped over onto her back and started chatting to Ivan. He scolded her and got her back into position but she continued to pick her face up above the water. Every time she was scolded the rest of us could crack up and get water in our snorkels, which caused us to pick our faces up out of the water. All of a sudden we were the ones getting scolded, Marykate was giggling, and it was a continuous feedback loop. It was a slippery slope there for a minute, but eventually we got the hang of it. The water was so clear that we could see for over 100m into the fissure, and the fact that the current moved us along for the first 20 minutes meant that we could just float along without effort and marvel at everything below us. Eventually the channel opens up to a lake where Ivan finally allowed us to swim. We each took off like bottle rockets, using our flippers to move us through the water, until we'd had our fill and were ready to get out of the water. After some complimentary hot chocolate we said our goodbyes to our main man Ivan and were off to see the next stop of the Golden Circle. 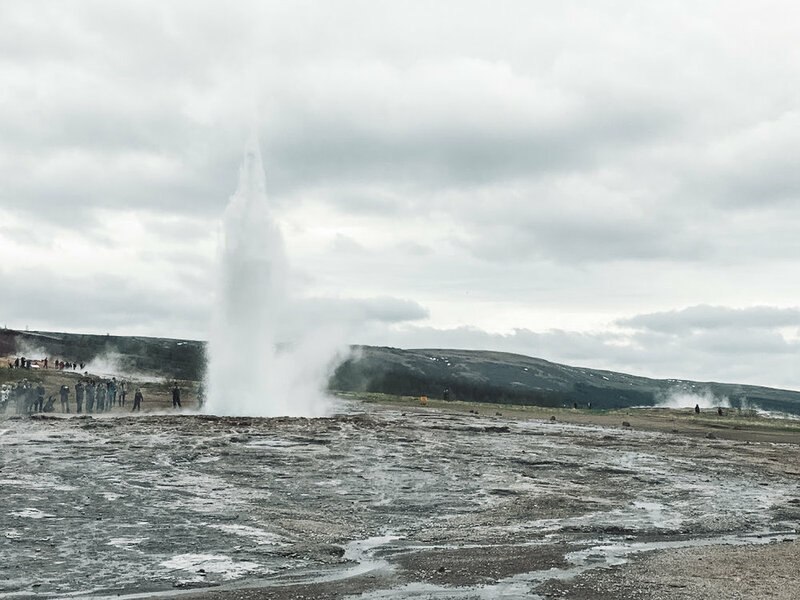 The second stop along the Golden Circle is the Geysir Geothermal Area, located within the Haukadalur Valley. Here, there are two geysirs that have made the area famous. The first is the Great Geysir. Originally known to shoot water every third hour leading up to the third century, it's been dormant since 1916. The second is Strokkur, Iceland's most reliable geysir, shooting water 20 to 40 meters into the air every ten minutes or so. When we arrived at Strokkur there was a crowd of people gathered around the geysir waiting for it to erupt. Almost every person had their smart phones or cameras out and ready, anxiously waiting to get the perfect shot or video of the geysir erupting. Amused, we pulled our own tech out at did the same. We each had our own jobs; Erin was tasked with getting the perfect boomerang, Marykate was responsible for getting a quality handful of pictures on her camera, and Megan and I were meant to capture as many pictures as we could using our iPhones. The crowd across from us must have been watching the time because they all started shouting around the same time and seconds later the geysir shot into the air. We lucked out and got the right bit of everything on the first try so we took a few minutes to look around and then headed back to the car for stop number three. On our way back to the car, cheers from the crowd followed us letting us know that the geysir had gone off again. The waterfall Gulfoss is just a ten minute drive from Geysir. The waterfall flows from the river Hvita and tumbles 32 meters (105 feet) down two drops into a canyon so deep that you can't see the bottom. It's known for its incredible rainbows on sunny days, but unfortunately we were dealing with an overcast day and saw no such displays. We chose to stay at one of the first vantage points we came to, but there are paths that take you to different lookouts that give you a view of the falls from varying heights and angles. Gulfoss is an undeniably magnificent force and was the first of many beautiful waterfalls we saw during our trip. The Crater Kerid is a stunning volcanic crater made 6500 years ago with red, yellow, and green streaked sides and a turquoise lake filling the bottom. The crater is one detour we added to our trip. By the time we reached the crater we were at around hour 10 into hour trip, but even though we were exhausted we took our time here. There are two major paths, one that runs around the top of the crater, and one that takes you down to the surface of the lake. We chose to stay at the top and slowly followed the path, completing a 360° loop around the crater. The Crater is considered an extra or a detour along the Golden Circle, but it's one that I would highly recommend. It's a place that no picture will ever truly capture and that leaves a lasting imprint on the mind. 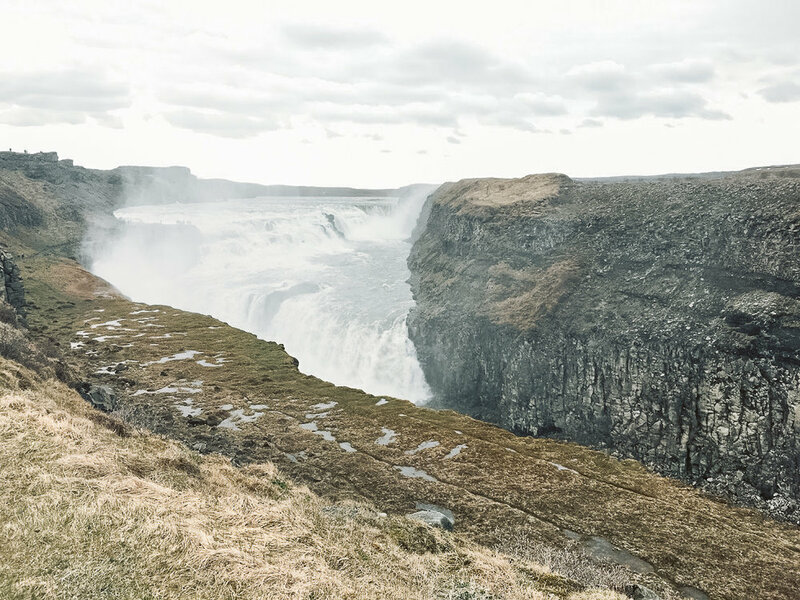 The Golden Circle is a must-see and a must-do during anyone's first trip to Iceland. It can be taxing; it requires a significant amount of time in the car, a longer amount of time on your feet, and can be quite draining. But during that day one alone, you will see multiple natural phenomenon that just can't be found in the same combination anywhere else in the world. And that, my friends is why it's worth it.